Get all the benefits of pea protein in a delicious vanilla shake! VeganSmart Pea Protein™ is a natural plant-based protein that is derived from yellow peas (Pisum sativum), also known as “split peas.” This product is highly soluble, easy to digest, hypoallergenic – and it tastes great! VeganSmart Pea Protein™ is formulated using only the highest quality pea protein isolate available. Its phenomenal amino acid profile includes nine essential amino acids. Since essential amino acids cannot be synthesized by the human body, they must be supplied by our diets. Amino acids are the building blocks of proteins and are used by our bodies to support our bones, muscles and connective tissues. VeganSmart Pea Protein™ is all natural and contains no animal by-products, no artificial flavors, no artificial sweeteners and no artificial colors. We use non-GMO pea protein that is 100% gluten-free, cholesterol-free, soy-free and dairy-free. Each great tasting vanilla shake provides an excellent source of vegetable-based protein and is suitable for low-carbohydrate dieters, vegetarians, vegans, children, athletes and anyone needing extra protein in their daily diet. NO ASPARTAME, NO ACESULFAME K, NO ARTIFICIAL SWEETENERS, NO ARTIFICIAL FLAVORS,COLORS OR PRESERVATIVES, NO MSG, NO SOY, GLUTEN FREE, NO EGG, NO DAIRY, NO YEAST. 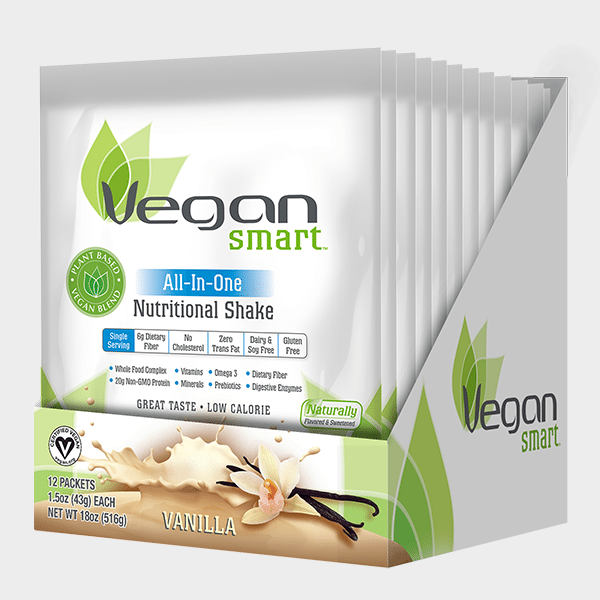 Directions (adults): Mix two level scoops of VeganSmart Pea Protein™ All-In-One Nutritional Shake in 9 to 11 ounces of ice-cold water, juice or non-dairy beverage, shake well and enjoy. 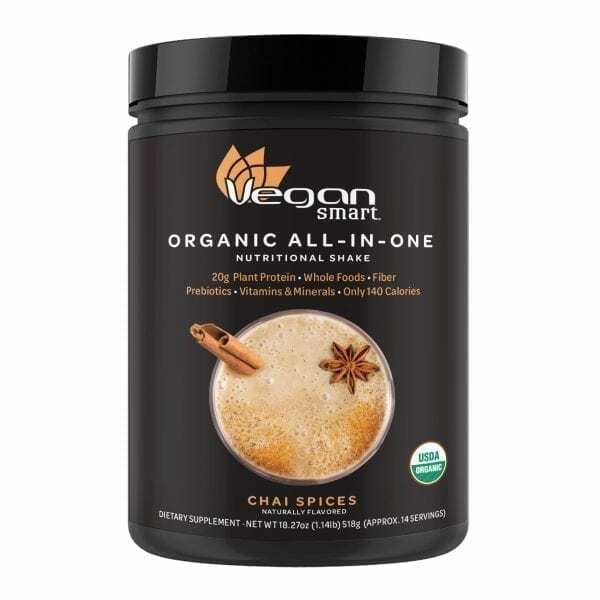 VeganSmart All-In- One Nutritional Shake is a complete protein blend that contains everything you need in just one serving: 20g Non-GMO plant-based protein, 6g dietary fiber, 22 vitamins & minerals, a whole food complex (fruits and vegetables), omega 3 and prebiotics and digestive enzymes. Everything you need and nothing you don't. VeganSmart is available in seven delicious flavors: Vanilla, Chocolate, Wild Berries, Chai, Cookies & Cream, Chocolate Raspberry and Strawberry Shortcake. Love VeganSmart and want to make some money? Refer your friends and get paid on every purchase! See how our affiliates are able to take advantage of this program and sign up today. Copyright © 2018 Naturade, a division of Prevention, LLC. All Rights Reserved.